Reigning MotoGP™ eSport Champion TRASTEVERE73 became a double title winner after producing the perfect Grand Finale in Valencia, beating the super impressive ELEGHOST555 to the win after a stunning race long battle, with ANDREWZH completing the podium. It was TRASTEVERE73 who put his Ducati Team machine on pole position in the ten-lap qualifying session ahead of the Grand Finale, with the Tissot Award being handed to him on stage by five-time MotoGP™ World Champion Jorge Lorenzo. Before the competitors went racing, another multiple MotoGP™ World Champion took his place in the eSport arena: seven-time World Champion Marc Marquez swapping throttle for microphone as he took a seat as a commentator for the Grand Finale. Then, it was time. The lights went out and the 2018 Grand Finale was underway, and the Italian got off to a perfect start as he took the holeshot into Turn 1 – but there was drama for front row starter CRISTIANMM17 as he crashed at the first corner, along with ADRIAAN_26 and XXBOMBER_45XX. However, from the first lap it was all about two riders for the win: TRASTEVERE73 and EG 0,0 Marc VDS’s ELEGHOST555. The duo were locked in a battle right from the opening lap, with ELEGHOST555 clinging onto the tailpipes of the leading Desmosedici machine. The pair exchanged fastest laps of the race to edge clear of third place ANDREWZH and despite dropping to 0.5 back midway through the race, second place ELEGHOST555 reeled in TRASTEVERE73 to set up a stunning finish at the Circuit Ricardo Tormo. Tensions and nerves were rocketing and as the two riders headed onto the final lap, the gap was just 0.3 seconds. 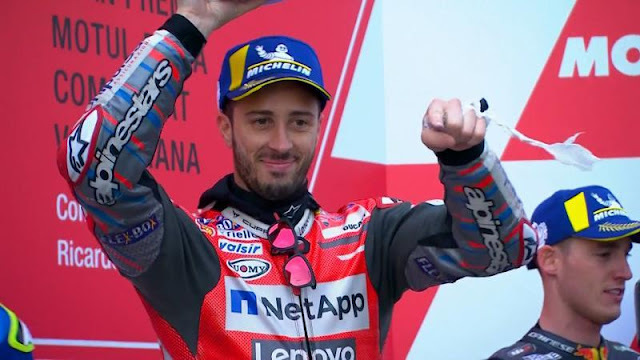 However, despite the best efforts of the Honda rider, the inch perfect riding from the 2017 Champion didn’t allow for a move to be attempted and as he held the line through the tricky Turn 14, TRASTEVERE73 nailed the exit to take P1 and the title, with ELEGHOST555 having to settle for a stunning P2 finish. P3 and the final podium spot went the way of ANDREWZH on board his Movistar Yamaha MotoGP machine, with Red Bull KTM Factory Racing’s TIMOTHYMCGARDEN crossing the line in P4 after a solid ride. So there we have it, what a stunning performance from TRASTEVERE73 to take the crown of 2018 MotoGP™ eSport Champion in an enthralling Grand Finale. Will the Italian be able to fight his way to the hattrick in 2019?